The osprey tracked the arc of Evangeline's boot as she swung it back and forth under her perch on the bowsprit. The two of them balanced on the beam, watching the water below as they sped towards Silence. The rumors whispered about the Ars Moriendi always had it flying over the water, the barnacles on its hull scything through the waves as it went, and when the ball of Evangeline's foot obscured the point where the prow split the sea it became true for her and her companion. The water rushed by, looking for all the world like it passed without a single ripple. It was almost time to send the hungry raptor ahead to scout the town, but as the sun beat down on Evangeline’s dark hair, she considered dropping anchor further out and postponing the work of navigating yet another sleepy port town. The work would wait, after all. Still, she knew it never paid to wait and that there would be plenty of time to relax later, so she met the bird's eye and he stretched his wings out for the breeze to lift him up and carry him to Silence. After a couple moments, Evangeline stood and swung herself back over the railing on to the deck. She saw John swinging the wheel towards port, and walked down the stairs to her quarters to prepare for their arrival. As she unstrapped the less diplomatic parts of her outfit, the bandolier of throwing knives and a garter holding an envenomed dagger against her thigh, she went through the list of things she'd need to arrange for her crew once they got on dry land. The Ars Moriendi traveled light, but in these damnable tiny ports you just never knew what you'd be able to find. She might have to work some magic in this town, if its reputation proved true; it sounded dismal as hell, even though people said the harbor tavern was decent. The problem was, no one could explain what made that place so great. The closest anyone could gather was that the beer was good, which didn't seem all that promising, and certainly didn't tell you anything about whether they had so much as a heap of straw to lay your head on. Evangeline stowed another knife in the straps along her ribcage, wrapped her revolver into the scarf at her waist, then shrugged on her jacket and turned slowly on the spot, examining the effect carefully for telltale bulges. As she made her way back on to the deck, the breeze blew some of the tatters of chapel veil across her face. The day she'd come to the Ars Moriendi had begun in a church, where she'd convinced yet another priest that it would be easier to work off her penance in the confines of the confessional than to waste time chanting prayers. He was the last priest in fifty miles who had let her get her way, just like everyone else whose will she crossed, and when she left the church, the Ars was waiting in the docks. Dry land was no contest anymore, so she took to the sea. She couldn't have known that the captain had collapsed as she stepped onto the deck. But when she discovered that the ship was suddenly bereft of leadership, it only took a couple shifts in tone and a handful of white lies to convince the crew to let her try her hand. She was disappointed how little effort it took, but as they set off she decided to wait and see what the ocean had to offer. So far, it hadn’t disappointed. Her presence at the helm had elevated the ship’s reputation, and the theories about the female captain with the black veil twined through her hair only increased the interest in their work. People loved to build up her story, and she wasn’t about to complain. She tucked the stray strands of veiling back into the pins holding her hair and started back to the wheel to bring the ship in to shore. The crew began to cut sails to slow the ship’s progress. The osprey caught up with them as the ship slipped into the bay. He came bearing gifts, dropping the traditional Something Red and Unpleasant at Evangeline’s feet. “I appreciate the thought, my friend, but you really shouldn’t have,” she said, “I assure you, we’ll be able to find din…ner.” The Something Red had rolled closer to her as the Ars swayed over a small wave. It appeared that today’s gift was an eyeball, about the same color as her own green eyes but significantly less attached to a human. “Where the hell did you find THAT?” she asked him, but he just looked at her and chomped down hard, probably figuring that if she wasn’t going to eat it, it shouldn’t go to waste. Most people probably wouldn’t have interpreted the delivery of human organs as a positive sign, but Evangeline couldn’t help but think it added some kind of interest to the town. It didn’t take long to drop anchor and row into the docks, and as usual, the crew of the Ars Moriendi was able to make its way into town without much resistance, bureaucratic or otherwise. 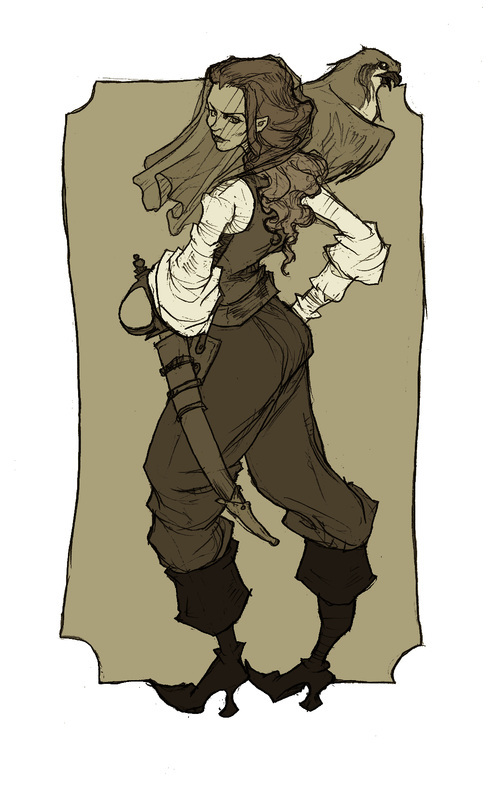 Amongst themselves, the sailors attributed the ease of their landings to Evangeline’s strange effect on people – they weren’t the least suspicious looking gang to wash up on shore, to say nothing of the reputation of your average bounty hunter, much less of those who picked up extracurricular, extralegal sidelines, but with Evangeline leading the way, no one gave them a sideways glance. Of course, Silence had only one decrepit dockmaster to greet all comers, so maybe the ease of this arrival wasn’t so significant. They traipsed past the old man and his equally derelict mongrel, and headed up the vacant streets. Silence looked like a ghost town. John was the first one to ask the obvious question –“where the hell are the people?” They continued on, peering in the windows and finding no one. Just over the crest of the hill, Evangeline saw lights. As they neared a glowing building, they saw a weatherworn sign hanging off the eaves by a collection of random hooks and rope: “The Eye of the Storm.” The osprey sat on the roof, and watched them pass under his talons before wheeling off to see what other delicacies might be available. He flew off under darkening clouds and passed quickly into the wide brace of forest that closed Silence off from the rest of the coast and the mountains beyond. The crew continued into the bar to find their own dinner, and the sun went down on the masts of the Ars Moriendi, floating gently on the muddy waters of the bay. Evangeline stood framed in the doorway, flanked by her men and watched by everyone else. She cast her gaze towards a clutch of brawny men under the grimy window, and they immediately developed the urge to be elsewhere. They shuffled out the door amid a chorus of goodnights to the barmaid, and the crew settled in while Evangeline headed up to the bar. The barmaid was hovering over a massive cauldron of soup in the center of the room, but one of the men kindly called out “hey Myst, you got some business over here,” and she was there in a flash. “I’d love a pint of that famous brew you’ve got,” Evangeline said, staring the quiet barmaid in the eye, “as would my men.” Mystery brought over six steins of Hag’s Blood, which Evangeline relayed to the crew before returning to the bar. Mystery was waiting with a seventh stein. Evangeline slid the mug in front of her and told Mystery who she was looking for. Mystery immediately remembered the strange gin drinker from earlier that evening, but she picked her words carefully. She hadn’t liked the way her patrons had just popped up the second this woman looked at them – normally it took the poker and the threat of being banned from the bar for a week to get them to leave at close! Of course, she hadn’t liked that man, either. Sharp. Evangeline wasn’t buying it, but she simply accepted the answer and asked about lodging for the night. Mystery showed her the back room, covered with a random smattering of straw, and she nodded, saying it would be good enough. She headed back to the table with bowls of soup for her crew, sat, and leaned back in her chair, watching Mystery move around the room. “Thank you, Skip.” She kissed his cheek, causing him to blush and retreat back to his own table. The night was drawing to a close and as she drained the last sips of beer, the osprey reappeared at the window. She let him in quickly, ignoring the stares of the other patrons. She gestured with her head, saying “Woods. Find the red haired witch-hunter.” Then she headed to the back room to rest for the day ahead. Evangeline woke to the gentle tugging of the osprey on her veil. She looked up to see him peering at her with the early sun slanting through his amber eyes. She scraped pieces of hay from her face, sat up, and the massive bird hopped onto her forearm. The osprey tilted his head. Evangeline watched him for a moment, then rose, stretched and carried him into the next room, where the crew lay, blissfully snoring. At the sound of her boots, the men were startled awake, instantly ready for instructions. She took a seat on the windowsill. “We need to find this character and figure out why suddenly the buffoon of the duo is traveling alone,” she said, ignoring the osprey as he nibbled at her veil. “I last saw Claude three years ago and he was still carrying the saber on him, so let’s make sure we get our hands on it before that idiot Sharp does anything…idiotic with it.” The crew had been told about this mystical sword, but Evangeline suspected they didn’t believe it; what she did know was that they would follow her wherever she wanted to go. The crew paid a mousy daykeeper on their way out the door, then followed the osprey towards the woods, the same way Skip had told them the witch hunter Sharp had gone the night before. Evangeline took this as a good sign – at least he seemed to be carrying out fairly mundane jobs. After an hour’s walk, the crew came upon a bizarre sight…a man with blazing red hair, entirely pants-free, crawling along the ground. His shoulders and head arched back off the dusty road like he was being yanked by some invisible leash towards a small house just inside the treeline. Evangeline nodded Luke and John over to him. When they lifted Sharp from the ground, he latched on to them like a lamprey. Given his state of undress, it was a little awkward for everyone. Trying not to violate him too badly, Luke and John muscled him over to a tree and held him against it, but as they pushed his back to the bark, he began to jerk towards the house with the same strange angling that he’d exhibited on the ground. “Stop fighting ,” John told him, but all the man could offer was a choked gurgling and some inaudible babble. Despite Luke’s hand hovering near his throat, Sharp expressed only a driving desire to get the hell away from the house. When he tried to speak, the massive deckhand heard only gibberish. Unsatisfied, Luke clamped down on Sharp’s windpipe, cutting off his air, then drove a heavy fist into his midsection. Luke held his chokehold for just a moment before letting the air sail out of Sharp’s throat. He followed the deflation by slamming Sharp’s back against the tree, just for good measure. Luke and John let him fall to his knees, then crumple to the ground in a whiny heap. As Evangeline and her men looked on, his insensible body started inching towards the house. Mark placed a foot on Sharp’s shoulder as he came near, but the body pivoted around it, now heading towards Evangeline, which proved too much for Mark to stand. He kicked the man solidly in the stomach, flipping his body over and returning it to the tree. The men started towards Sharp, but Evangeline got there first. He groaned and swung his head around to look at her, utterly pathetic in his pantless state. She lifted him up and held him at an arm’s length against the tree. The pull towards the house seemed to slacken, and he was able to stay flush against the trunk. He seemed relieved. “Good.” Some years ago, Sharp and Claude had pursued Evangeline. When they accused her of witchcraft, she told them just how silly that was. She could be quite convincing. Just then, the osprey, flying from the tree, drew their attention to the house. There was someone in the top window, watching the scene unfold. Evangeline stared into Sharp’s face and asked him again for Claude’s whereabouts. By now, he was supporting himself against the tree. He shook his head, belched mightily in her face, then blinked several times. Evangeline stared at him, unimpressed but convinced of his truthfulness – after all, losing an arm didn’t generally leave you in perfect health. She sighed and asked him where her saber had gone. Evangeline released him and turned around to her men. “I’m guessing that he’ll probably take us to it in a moment,” she told them. Sharp slumped to the ground, his eyes on the osprey, perched on the upstairs shutters of the house. A figure came to the window, and gestured towards Sharp with a gleaming saber, smiling a wry smile and dropping an object to the ground below. The beaten man said “nnnngh” and began sliding powerlessly once more towards the house. Evangeline followed him to the thrown gauntlet, picked it up, and moved toward the witch’s door.